Thyroid disease is one of the most common diseases that usually occurs in women. It happens when the thyroid gland could not supply the appropriate amount of hormones required in the body. There are two diverse condition if you have this disease and they are called hypothyroidism means the thyroid is releasing inadequate amount of hormone to the bloodstream. The other condition is hyperthyroidism your thyroid releases too much hormones in the bloodstream. One indication of a person who has hyperthyroidism is when the eyes appear to bulge out, look like they’re staring or always feel irritated. But, no matter what the condition is whether a person is hypo or hyper the thyroid can become larger than normal. When the lump under your skin in the thyroid can easily be seen or felt it is called goiter. 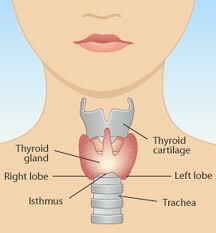 If you suspect that you have a goiter you can do a thyroid self-exam at home. Get a glass of water and stand in front of the mirror, drink some water while you swallow, watch your neck between your Adams apple and collarbone. If you notice something unusual like a bulge or a lump around your thyroid gland then it is best to see your doctor. It may not be alarming but it could also lead to thyroid cancer. Your doctor will guide you and start any treatment necessary for your condition. If everything feels normal then nothing to worry. An auto-immune disease called Graves Disease usually is the most common cause of hyperthyroidism. This condition produces abnormal types of antibodies which make the thyroid gland produces more thyroid hormone and eventually thyroid gland will enlarge. The enlargement of the thyroid is called goiter. I suffered from goiter for how many years and I had my thyroidectomy last November, 2010. But, I am still obliged to see my doctor every after three months.